PHS1 CMM Probe Servo Head - CMM Inc. The PHS1 offers you high flexibility and accessibility. Designed to meet the demanding requirements of 'body-in-white' measurement, this positioning head offersextra-long extensions and configuration/positioning at almost any angle. The PHS1 Servo Head features continuous servo drive in two axes – allowing the user to rotate the probe system in any direction without a recalibration. The PHS1 head is not locked into position the same way as a PH10 indexing head. Instead, it is driven to approximately the required position and once a probing point is taken, the axes of the head will latch instantaneously with the axes of the CMM. This will result in more accurate measurements for the user. 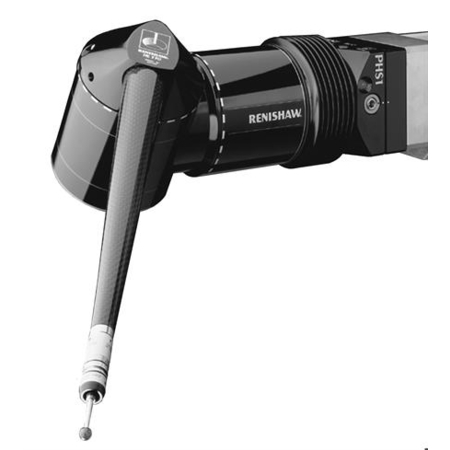 The PHS1 head is controlled directly from an interface card in the CMM controller. Full information is given in the PHS1 programmers' guide. The user can measure hard to reach positions and normally inaccessible features with extra-long extensions. The head is protected by a built-in overtravel protection unit. This will effectively signal the machine to stop in the event of a collision. The PC interface card (within the CMM controller) controls the PHS1 head. The interface card transmits communication and condition signals between the head and the CMM controller. It does not handle probing system signals. The interface card receives its electrical supply from the PC's 5V internal power supply. The PHS1 head receives its power from the PC's internal 12V supply and an external 24V supply. A kinematic mount (KM1 or KM2) allows rapid fixing of the head to the machine and a speedy changeover to a PH10 system (utilising a PHA1 or PHA2). The ACR2 autochange rack allows probe extensions or adaptors to be exchanged to suit the probing task that is being completed. This is done without manual intervention. All locking and unlocking of adaptors and extensions is done by the motion of the machine. Thanks to itsflexible construction and simple operation, any number of racks can be positioned on a pillar anywhere within the machine’s volume.